Have you heard about the Kaffirs? The Kaffirs' performance at the Barefoot was a magical one which saw many Sri Lankan African descendants giving us a night to remember. Pretty Sri Lankan-born African Sherine who is married to a Sri Lankan said, "We're very happy to be performing here for the second time for it is good to celebrate the fact that we are African people. It is a privilege to share our music and culture with the rest of Sri Lanka through this concert." The Kaffirs (English, also cafrinhas in Portuguese or kapiriyo in Sinhala) are a Sri Lankan ethnic group who are descendants from the 16th century Portuguese traders and the African slaves, brought by them. The Kaffirs spoke a distinctive Creole based on Portuguese, the now-extinct 'Sri Lanka Kaffir language' and their cultural heritage includes the dance styles 'Kaffringna' and 'Manja' which they performed recently at the Barefoot cafe. It was a fun-filled gig with plenty of thumb-thumping beats with rhythmic drums and happy-go-lucky 'baila' dances. The astounding Sufi musician stunned the audience with his powerful voice and heart-stopping drum beats. It was an amazing concert of rhythmic mantra and delightful dance. Daily News 'Artscope' caught up with the organizer of the concert and Fulbright researcher of the Kaffirs, Leah Worthington to ask more about these interesting people who actually hail from Mozambique. There are a multitude of ethnicities in Sri Lanka. Why is there a need to highlight the Kaffir people? As someone engaged in historical research, I think every group of people, regardless of how big or small, deserves a voice, deserves to be acknowledged. I'm happy that some of the Kaffir people have discovered avenues in which they can tell their story. Their story is not only part of Sri Lankan history but also tied to the broader history of the African Diaspora in the Indian Ocean region. Please give a brief explanation about the Sri Lankan Kaffirs and their music? There is a long history, dating back to the 1500's with the Portuguese, of people being brought from Africa to Sri Lanka - some as soldiers, some as domestic help, and other jobs as well. There are many stories about where in Africa the Kaffirs in Puttalam originated from. The oral history of the particular Kaffir family that I spoke with (the family who played at the concert) says they are descents of former Portuguese slaves brought from Goa, India by the British to be soldiers in Sri Lanka. 'Manhas' are what the songs are called that are played by the Kaffirs of Sirambiyadiya - their village not far outside of Puttalam town. While the music is different in technical ways from Kaffrinha and Chikothi (both of which are kinds of music with African roots), all of the movements in their dance point to its African origins, as has been noted by academics in the past. As different waves of Africans came into Sri Lanka, they brought with them various traditions and styles of music that reflect the different areas of Africa from which they came. 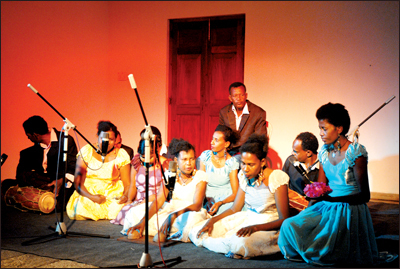 This accounts for the variety of types of music with African roots that have developed in Sri Lanka. The music and dance that was seen at the last year's November concert was seen again on June 27th at the second Barefoot concert exemplifying the history of African music in Sri Lanka. After the first concert was held, there was enthusiasm and interest from many to know more about the Kaffir people. Is the Kaffir concert a way in which the Kaffir people can preserve their traditions and to enlighten their children about where they originally came from? The Kaffir concert is certainly helpful in the preservation of their music and dance, which are the only cultural remnants of their African roots. While the Kaffirs are proud to be Sri Lankans, they also acknowledge their African history. Being able to share this tradition of music serves as a way of both bringing respect to them within their local community and validating their cultural differences. While their exact place of origin along Africa's east coast may never be known for sure because of a lack of documentation and conflicting oral histories, promoting their music allows for their future generations to better understand the Kaffirs' history. The more concerts they put on, the more outside interest the community receives, which has both researchers and journalists looking for sources to tell the story of the Kaffirs of Sri Lanka. Will this be an annual concert? How does this concert empower the Kaffir people? The last concert and this upcoming one have happened because people that know this Kaffir family have helped them make connections with people here in Colombo. Jesse Hardman, a friend of the Kaffirs, has been instrumental in organizing their concerts and getting their CD produced. I would hope that opportunities for the Kaffirs to put on concerts will continue to arise, that people will continue to take an interest in their music - not just because it is important to them, but also because it is enjoyable for those who attend. The last concert was a hit with people on their feet, clapping along. So music is culturally valuable, yes; but it's also something that we all enjoy having in our lives. New types of music have a way of introducing us to different parts of the world, and sometimes different parts of our own country that we might not otherwise have known about. Everyone also needs to provide for their family. For the Kaffir families to be able to do so via their music, allows them to provide for their family while paying respect to their cultural roots.